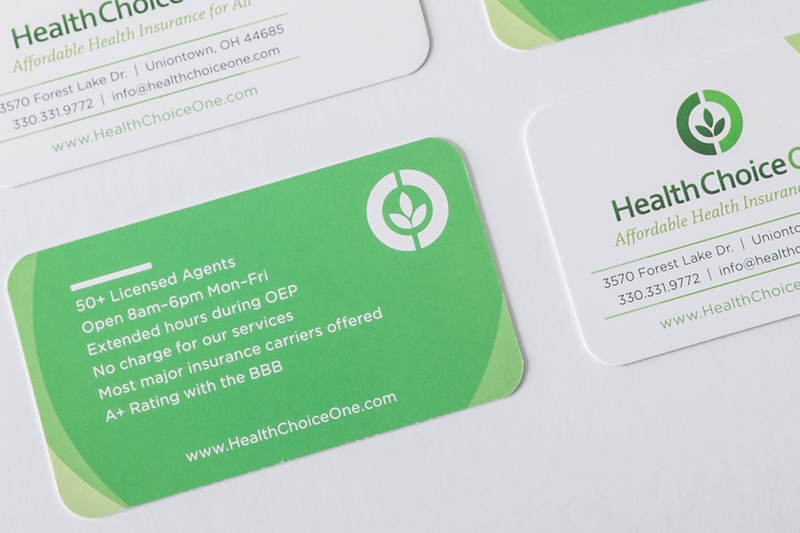 Health Choice One’s large staff of licensed health insurance brokers made printing individualized business cards impractical, so they tasked us with designing a single card that served all of the staff while also highlighting some of the things that make Heath Choice One’s services stand out. 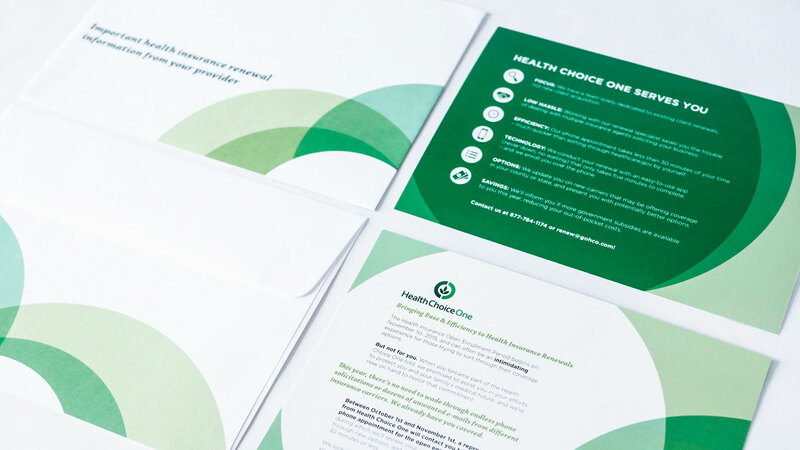 We continued the overlapping circle motif from last year’s mailer, introduced rounded corners, and took full advantage of the brand’s signature bright green color palette to create a card that feels friendly and approachable, just like the staff at Health Choice One. Early autumn is an important time for Health Choice One; as a broker of health insurance, they help their clients navigate through the open enrollment season to re-negotiate or renew their insurance with one of a myriad of companies. 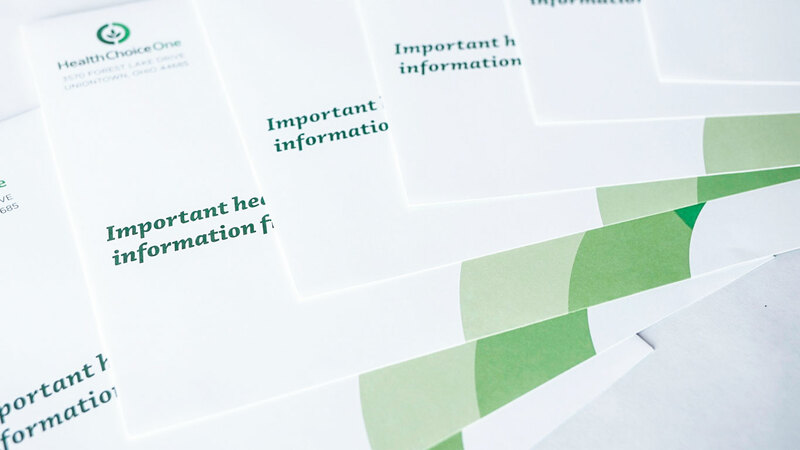 They came to Cassel Bear for help with a jumbo postcard mailer and envelope for all of their current clients. 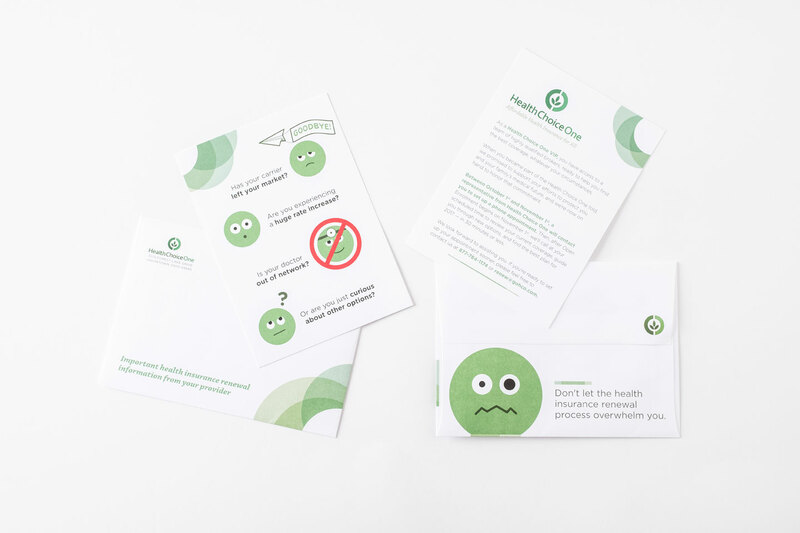 Designed to alert recipients to the need for timely renewal, the mail piece needed to inform clients that they might be able to obtain better rates, remind them to stick with Health Choice One rather than succumb to calls and e-mails from competing brokers, and compel them to schedule a call with a Health Choice one representative. All of this in a quick and easily digestible format. 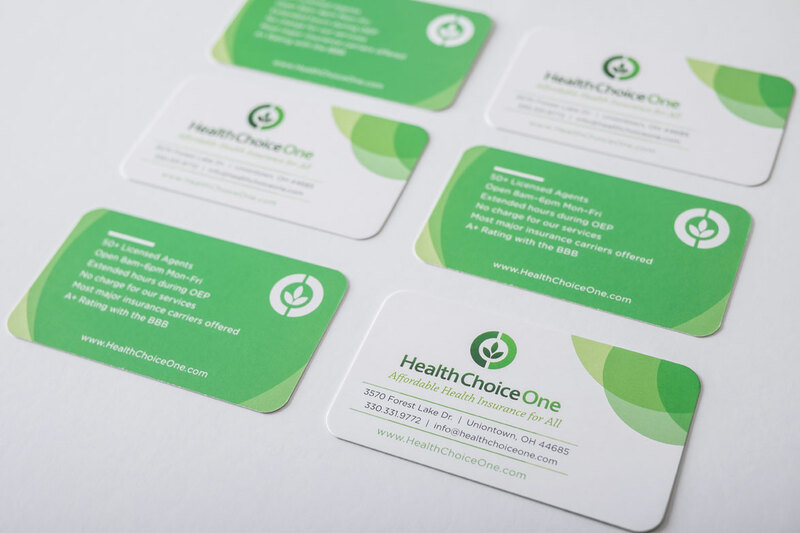 Our friends at Health Choice One returned to Cassel Bear in 2016 because they were pleased with the results garnered during the Open Enrollment period in the fall of 2015. 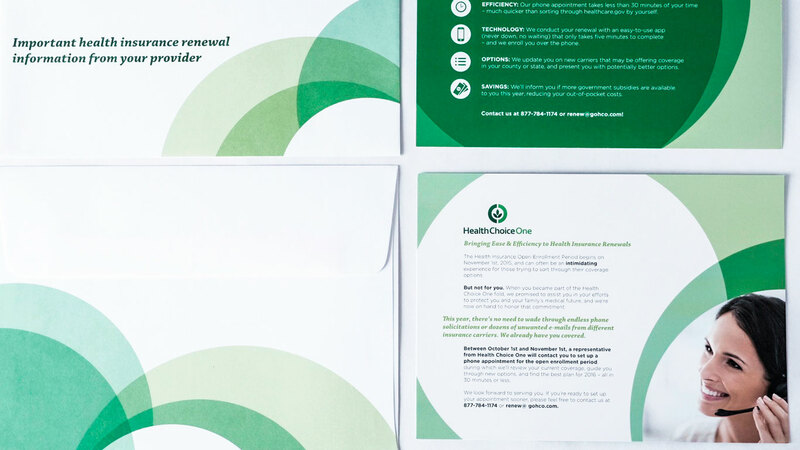 In one respect, our task was the same: to design a re-enrollment mailer that would remind HCO’s current clients to call their insurance broker to renew a policy or search for something better. 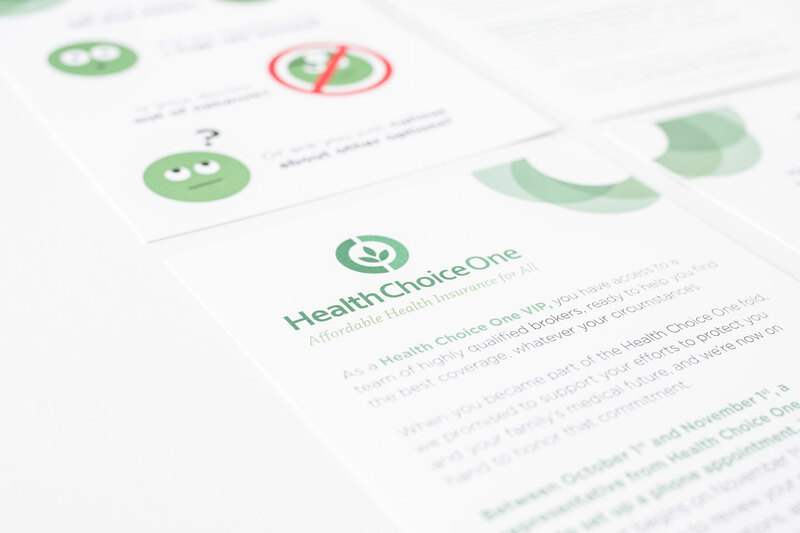 But there was a twist: Health Choice One hoped to add an element of fun to the proceedings and tasked us with creating a mascot or a character to appear on this and several other pieces. We drafted several possible options, including an octopus in the style of Charley Harper, some birds, and even a reference to the Goofus and Gallant cartoon from Highlights magazine. 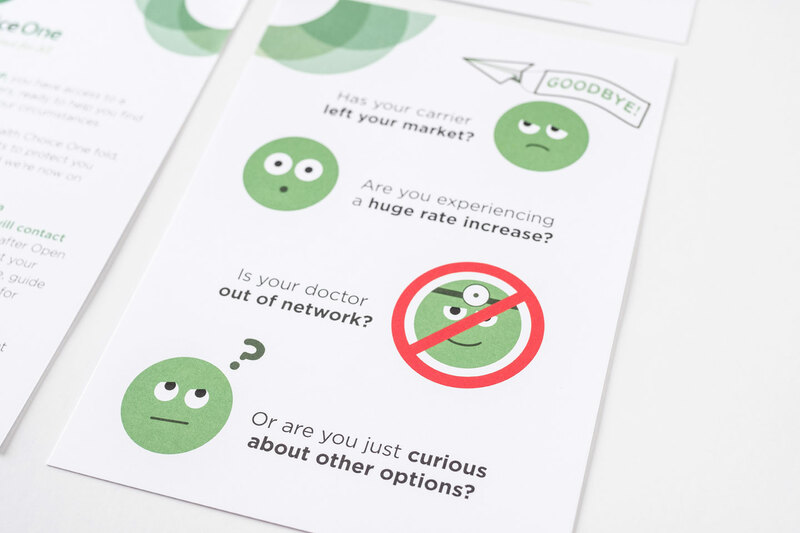 But we ultimately ended up playing with the idea of original emojis to illustrate the different situations that might cause a client to seek a new insurance provider.